Given that this event was organised for a bank holiday weekend, it was pleasantly surprising to plan for the evening with a high degree of confidence of clear skies. Mark, Andi and Keith made the journey over to Northcliffe holiday park at Hawsker, (Andi and Keith checking out Seaview park en-route), three scopes packed including the LX 200. 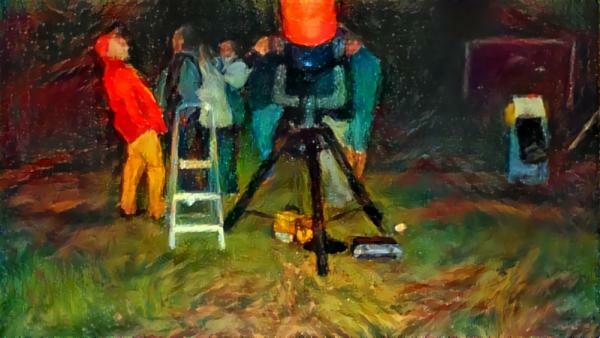 Once we had negotiated the bollard and gate (don’t ask) leading to the football field, the instruments were set up and we prepared for a great evening’s observation. The location was great for our purposes – clear aspects, flat ground and plenty of it so that we could demonstrate the scaled solar system. This played well with the attendee’s...estimated to be around 40. The crescent moon was our first port of call, shortly followed by Saturn, which was unhindered from obstructions. Both objects drew gasps. As twilight deepened, it was obvious that ‘seeing’ would be very good for a coastal location. Attention turned to deep sky objects, The Ring nebula (M57) looked magnificent, brighter, with so much more detail present. The same was true for all the objects targeted, making it a real joy for people experiencing their first views of such deep sky wonders. Mark conducted a tour of the night sky, borrowing Keith’s laser pointer for the purpose having stupidly left his own at home...Dohh! With conditions fully dark, the Milky Way was clearly visible to the naked eye, arcing across the sky from NE to SW. It has to be said it was a pleasure to be out under the stars, an experience shared by all present and stayed on. By 23:00h it was time to pack up – thank our hosts Andy and Sophie who had organised the event at the site. We all expressed a desire to host another one – making it a regular event perhaps. Watch this space.